Reading and share top 181 famous quotes and sayings about Miner by famous authors and people. Browse top 181 famous quotes and sayings about Miner by most favorite authors. 1. "She had had the idea that the mineral world was a world of perfect, inanimate forms, with an unchanging mathematical order of crystals and molecules beneath its sprouts and flows and branches. 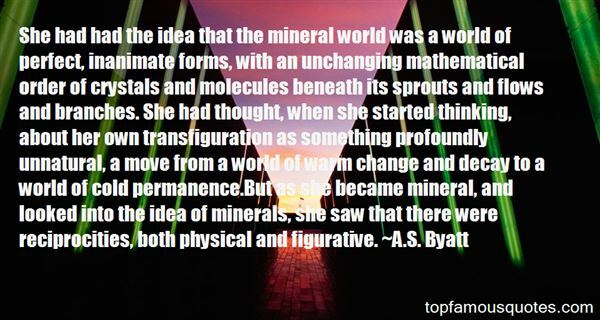 She had thought, when she started thinking, about her own transfiguration as something profoundly unnatural, a move from a world of warm change and decay to a world of cold permanence.But as she became mineral, and looked into the idea of minerals, she saw that there were reciprocities, both physical and figurative." 2. "My mother listened to all the news from the camp during the strike. She said little, especially when my father or the men who worked for him were about I remember her instinctive and unhesitating sympathy for the miners." 3. 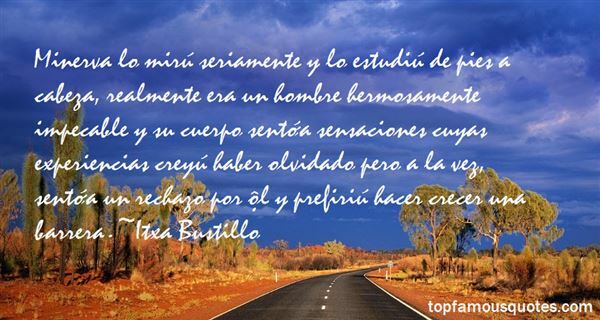 "I would rediscover the secret of great communications and great combustions. I would say storm. I would say river. I would say tornado. I would say leaf. I would say tree. I would be drenched by all rains, moistened by all dews. I would roll like frenetic blood on the slow current of the eye of words turned into mad horses into fresh children into clots into curfew into vestiges of temples into precious stones remote enough to discourage miners. Whoever would not understand me would not understand any better the roaring of a tiger." 4. "The Philippines has vast minerals that are still untapped. It has one of the world's largest deposits of gold, nickel, copper and chromite. Through responsible mining, we intend to generate more revenues from the extraction of these resources." 5. "For a long time it was assumed that anything so miraculously energetic as radioactivity must be beneficial. For years, manufacturers of toothpaste and laxatives put radioactive thorium in their products, and at least until the late 1920s the Glen Springs Hotel in the Finger Lakes region of New York (and doubtless others as well) featured with pride the therapeutic effects of its ‘Radio-active mineral springs27'. It wasn't banned in consumer products until 193828. By this time it was much too late for Mme Curie, who died of leukaemia in 1934. Radiation, in fact, is so pernicious and long-lasting that even now her papers from the 1890s – even her cookbooks – are too dangerous to handle. Her lab books are kept in lead-lined boxes29 and those who wish to see them must don protective clothing." 6. "You make me laugh, with your metaphysical anguish, its just that you're scared silly, frightened of life, of men of action, of action itself, of lack of order. But everything is disorder, dear boy. Vegetable, mineral and animal, alldisorder, and so is the multitude of human races, the life of man, thought,history, wars, inventions, business and the arts, and all theories, passionsand systems. Its always been that way. Why are you trying to make something outof it? And what will you make? what are you looking for? There is no Truth.There's only action, action obeying a million different impulses, ephemeralaction, action subjected to every possible and imaginable contingency andcontradiction, Life. Life is crime, theft, jealousy, hunger, lies, disgust,stupidity, sickness, volcanic eruptions, earthquakes, piles of corpses. what can you do about it, my poor friend?" 7. "There are no mineral monsters." 8. "And one day when you wake up, you happen to realise that your battle isn't with the man you had got into a brawl with the other day, it isn't with a friend turned foe, it isn't with those parents who chose to give up on you, it isn't with the bus driver for not having waited until you got in, it isn't with the employer who cancelled the application to your leave, it isn't with the examiner who resolved into failing you, it isn't with the woman who did not reciprocate your feelings, it isn't with child who dropped his ice-cream cone on you, it isn't with your ill fate and it isn't with that superior being above you. Your battle, your fight isn't against the world but against yourself and the only way to come through all of it and beyond, to win, is improvement, self-improvement which needs to be gradual and progressive with the transverse of each day." 9. "The traffic system needs a complete rethink," mused Bryant as the unit's only allocated vehicle, a powder-blue Vauxhall with a thoroughly thrashed engine, accelerated through Belsize Park. "Look at these road signs. Ministerial graffiti." "It's no use lecturing on the problem, Arthur. That's why your driving examiner failed you thirty-seven times." "What makes you such a great driver?' "I don't hit things." 10. "I look over at him. He stares straight ahead. "So," I say. "Golem, huh? ""I prefer the term 'Mineral-American." 11. "He dumped its contents out on the tablecloth: a gold ring, a gold nugget, and a gold signet seal. Francisco pointed to each. I told you that this was the secret of happiness. The three objects belonged to a rich collector. When he was asleep they argued all the time. The gold ring declared it was better than the other two because miners had risked their lives to find it. The gold signet said it was better than the other two because it had sealed the messages of a king. They argued day and night, until the ring said. ‘Lets ask God', He will decide which of us is the best. The other two agreed, and so they approached the Almighty. Each made its claim for being superior. God listened carefully, and when they were done, he said, ‘ I cant settle your dispute, I'm sorry. The gold signet seal grew angry ‘What do you mean, you cant settle it? You're God.' That's the problem said God. I don't see a ring, a nugget and a seal. All I see is gold." 12. "You know, Guido, at times I find it difficult to believe you do the sort of work you do. (Medical examiner's view of Commissario Guido Brunetti)"
13. "As we cannot afford to squander our natural resources of minerals, food, and beauty, so we cannot afford to discard any human resources of brains, skills, and initiative, even though it is women who possess them...a woman is just as much an ordinary human being as a man, with the same individual preferences, and with just as much right to the tastes and preferences of an individual." 14. "I can't escape being born in Pike County, Kentucky, grandson of a miner, Luther Tibbs, and his wife, Earlene, and traveling as a child up and down Route 23 between Kentucky and Columbus, Ohio, where I was raised, experiencing life via working-class people. Nor do I want to escape." 15. "Its tall chimneys throw up black smoke, impregnating everything with soot, and the miners' faces as they traveled the streets were also imbued with that ancient melancholy of smoke, unifying everything with its grayish monotones, a perfect coupling with the gray mountain days." 16. "Selon Ibn Khaldoun, il ne faut jamais oublier l'importance du climat. Le visage soucieux et l'allure renfrognée du Fassi, s"expliqueraient par le climat rugueux qu'ils endurent avec cet hiver givré de glace et de ce vent mordant qui souffle du nord. Je me demande pourtant si le climat a une telle importance pour déterminer la place de le séduction dans une culture donnée. A fès, il y a un mot pour désigner celui _ ou celle _ qui sourit sans raison. On dit qu'il "Farnass". C'est ce qu'on dit de quelqu'un qui a la lèvre supérieure qui fuit quelque peu et découvre les dents de devant. Petite, je m'entendais dire sans cesse: " Seul l'âne farnass". Serrer les lèvres 'avait donc rien à voir avec le froid! Cette attitude traduisait plutôt un certain un certain recroquevillement de l'être, une certaine absence de générosité au niveau du sentiment. A Fès, même un sourire doit être calculé, doit avoir un prix, une signification bien précise dans un réseau de comportements déterminés...."
17. "A distant cousin sent me some genealogy report on my father's side, and it's sort of what I suspected. Coal miners for generations... four or maybe five generations." 18. "Well, I'll tell you, one of things I'm proud of is for someone from Southern California, who didn't grow up around coal mines, I learned a lot that tragic day we lost twenty-nine miners at Upper Big Branch coal mine." 19. "Minerva lo miró seriamente y lo estudió de pies a cabeza, realmente era un hombre hermosamente impecable y su cuerpo sentía sensaciones cuyas experiencias creyó haber olvidado pero a la vez, sentía un rechazo por él y prefirió hacer crecer una barrera." 20. "Severus, please fetch me the strongest truth potion you posess, then go down to the kitchen and bring up the house elf called Winky. Minerva, kindly go down to Hagrids house where you will find a large black dog sitting in the pumpkin patch. Take the dog up to my office, tell him I will be with him shortly, then come back here." 21. "Harrison wrote a two-page poem about his deep feelings of loss when his dog Filbert died, and Mrs. Minerva, the creative writing teacher, gave it a B-minus. Do you know what that does to a a person to get a B-minus in Grief?" 22. "Some miners' wives take in washing and make more money than their husbands do. In every gold rush from this one to the Klondike, the suppliers and service industries will gather up the dust while ninety-nine per cent of the miners go home with empty pokes." 23. "... Y el pequeño tocador donde ya no queda sino un solo frasco que no sostiene sino polvo endurecido sobre una sustancia seca y transparente como resina mineralizada en la que quedó encerrada y conservada una mariposa nocturna para materializar y preservar la imagen del revolotear sin causa." 24. "Despite their exhaustion and worries, Miner and Ennek made love that night, tracing fingers and tongues over one another's marks and scars. Their bodies were like books, Ennek thought, and their stories could be read inch by inch. He hoped fervently for happy endings." 25. "E mentre le lancette scattano, qualcuno ha gli occhi chiusi. Non è ancora il suo attimo, ma presto il momento verrà. Di luci abbaglianti si illuminerà nuovamente il ponte. Di note sognanti si riempirà il pentagramma.Dall'altra parte c'è ancora una strada. Un palcoscenico pronto, perché riprenda a suonare l'orchestra.Dall'altra parte splende il sole.Dall'altra parte.E' iniziata la traccia nascosta del disco.L'interminabile silenzio è finito." 26. "Carly stopped at the base of the flags. One more foot forward and she would leave Alaska for the first time, and likely never see it again. She looked back over her shoulder for a long moment, and was hit by the fleeting temptation to turn around and coast back down the mountain to Skagway. But she turned to face forward, to face the future, full of unknown perils and uncertainties. It was a long and winding road to an unknown destination, a road that would take courage to face. And she found she had that courage, the same courage her history teacher had said drove the gold miners onward when there was just a narrow trail through these mountains." 27. "There's a new science out called orthomolecular medicine. You correct the chemical imbalance with amino acids and vitamins and minerals that are naturally in the body." 28. "Bullets they took from us, they took our riflesMinerals they took, and comrades too:But while our mouths have spittle in themThe whole country is still armed." 29. "Read non-fiction. History, biology, entomology, mineralogy, paleontology. Get a bodyguard and do fieldwork. Find your inner fish. Don't publish too soon. Not before you have read Thomas Mann in any case. Learn by copying, sentence by sentence some of the masters. Copy Coetzee's or Sebald's sentences and see what happens to your story. Consider creative non-fiction if you want to stay in South Africa. It might be the way to go. Never neglect back and hamstring exercises, otherwise you won't be able to write your novel. One needs one's buttocks to think." 30. "Roger Bacon held that three classes of substance were capable of magic: the herbal, the mineral, and the verbal. With their leaves of fiber, their inks of copperas and soot, and their words, books are an amalgam of the three." 31. "Here, are the stiffening hills, here, the rich cargoCongealed in the dark arteries,Old veinsThat hold Glamorgan's blood.The midnight miner in the secret seams,Limb, life, and bread.- Rhondda Valley"
32. "-Butelke mineralnej – poprosil Berlioz.-Mineralnej nie ma – odpowiedziala kobieta w budce i z niejasnych powodów obrazila sie." 33. "The miners lost because they had only the constitution. The other side had bayonets. In the end, bayonets always win." 34. "You were asking about the happy people: Well, they don't live on our planet, you see; we'll just have to wait, my boy! On this one human beings are not human beings. They are seamen and farmers and miners and lumberjacks; they are tramps and preachers and professors; they are this and that and the other. And happiness departed from them when they left off being human beings and became this other; for then strife began." 35. "Mineral cactai,quicksilver lizards in the adobe walls,the bird that punctures space,thirst, tedium, clouds of dust, impalpable epiphanies of wind.The pines taught me to talk to myself.In that garden I learnedto send myself off.Later there were no gardens." 36. "Autrefois, il y avait des galeries aux maisons. Et quelque-fois, les gens restaient assis, tard dans la nuit, bavardant s'ils en avaient envie, se balançant dans leurs fauteuils, silencieux s'ils n'éprouvaient pas le besoin de parler. parfois, ils restaient là, tranquillement, à réfléchir à ruminer. Mon oncle dit que les architectes ont supprimé les galeries pour des raisons d'esthétique. Mais mon oncle dit que c'est un prétexte, rien de plus; la véritable raison, cachée en dessous, c'est qu'on ne voulait pas voir des gens passer des heures assis à ne rien faire, à se balancer, à discuter; c'était une forme détestable de vie en commun. Les gens parlaient trop. Et ils avaient le temps de penser. Alors on a détruit les galeries. Et les jardins, aussi. Il ne reste presque plus de jardins...Et voyez les mobiliers. Plus de rocking-chairs. Ils sont trop confortables. Il faut obliger les gens à courir, à prendre de l'exercise." 37. "That's a much better kiss than the one you gave her when you won the shooting match! ""And a much better proposal of marriage than the one you gave her yesterday morning!" Minerva chimed in. "Leave him be!" Celia chided as Jackson went red about the ears. "He saved my life twice, figured out who killed Mama and Papa, and taught Gran some humility. We can't all be good at everything, you know. "Amid the laughter, he kissed her again, but her family didn't let that go on for long. It was cold outside, after all. Gran herded them inside to the great hall, where the servants had brought out refreshments. There, everyone had to take turns congratulating them and clamoring for all the usual details of how it had started and when it had become true love." 38. "Do you love him? ""I wish people would stop asking me that," Celia muttered under her breath. "What people?""Gran." She swallowed. "Mr. Pinter.""Mr. Pinter?" Minerva echoed with decided interest. "It's not what you think," Celia protested. "I hired him to find out the truth about my suitors, so he wanted to know if I was in love with any of them. "Minerva arched one eyebrow. "And why should he care? ""That's what I said. And ever since, he's been baiting me in front of them and telling me awful things about them to blacken them in my mind. ""Even Lyons?" Minerva said. "Well, no. I mean, I'm sure you've heard about the madness in the duke's family, but beyond that, Jackson hasn't found a single thing-""Jackson? "Celia colored. "Mr. Pinter." When Minerva kept staring, she added sullenly, "We've been in each other's pockets because of the investigation. That's all." 39. "Shakespeare opens a mine which contains gold and diamonds in unexhaustible plenty, though clouded by incrustations, debased by impurities, and mingled with a mass of meaner minerales." 40. "Goethe died in 1832. As you know, Goethe was very active in science. In fact, he did some very good scientific work in plant morphology and mineralogy. But he was quite bitter at the way in which many scientists refused to grant him a hearing because he was a poet and therefore, they felt, he couldn't be serious." 41. "My physics teacher, Thomas Miner was particularly gifted. To this day, I remember how he introduced the subject of physics. He told us we were going to learn how to deal with very simple questions such as how a body falls due to the acceleration of gravity." 42. "After reviewing the polygraph charts in private, the polygraph examiner told me that I had passed and that he believed I had nothing to do with the anthrax letters." 43. "On need of supplement & vitamins- "If you eat a balanced diet you get all the vitamins and minerals you need and you don't need any supplement and overdosing can actually be more harmful." 44. "Strange bent over these things, with a concentration to rival Minervois's own, questioning, criticizing and proposing. Strange and the two engravers spoke French to each other. To Strange's surprize Childermass understood perfectly and even addressed one or twoquestions to Minervois in his own language. Unfortunately, Childermass's French was so strongly accented by his native Yorkshire that Minervois did not understand and asked Strange if Childermass was Dutch." 45. "I Am VerticalBut I would rather be horizontal.I am not a tree with my root in the soilSucking up minerals and motherly loveSo that each March I may gleam into leaf,Nor am I the beauty of a garden bedAttracting my share of Ahs and spectacularly painted,Unknowing I must soon unpetal.Compared with me, a tree is immortalAnd a flower-head not tall, but more startling,And I want the one's longevity and the other's daring.Tonight, in the infinitesimal light of the stars,The trees and flowers have been strewing their cool odors.I walk among them, but none of them are noticing.Sometimes I think that when I am sleepingI must most perfectly resemble them--Thoughts gone dim.It is more natural to me, lying down.Then the sky and I are in open conversation,And I shall be useful when I lie down finally:The the trees may touch me for once, and the flowers have time for me. "I Am Vertical", 28 March 1961"
46. "He had to feel those lips on him again. Had. To. This wasn't a mild expression of preference. This was an imperative. His body was insistent. To continue hisexistence on this earth, he now needed the following: food, water, shelter, clothing, and Minerva Highwood's lips." 47. "Minerva considered herself a reasonably intelligent person, but good heavens . . . handsome men made her stupid. She grew so flustered around them, never knew where to look or what to say. The reply meant to be witty and clever would come out sounding bitter or lame. Sometimes a teasing remark from Lord Payne's quarter quelled her into dumb silence altogether. Only days later, while she was banging away at a cliff face with a rock hammer, would the perfect retort spring to mind." 48. 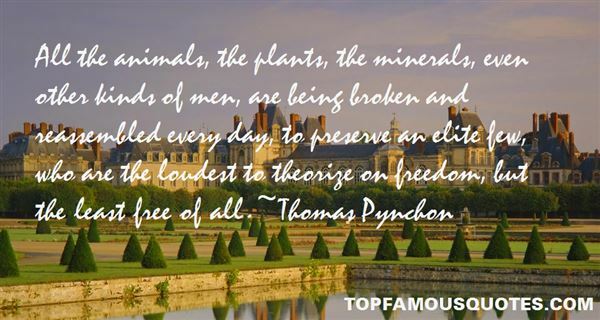 "All the animals, the plants, the minerals, even other kinds of men, are being broken and reassembled every day, to preserve an elite few, who are the loudest to theorize on freedom, but the least free of all." 49. "I come from a coal-mining, working-class background. My father was a coal miner." 50. "As Hegel put it, only when it is dark does the owl of Minerva begin its flight. Only in extinction is the collector comprehend." The masses don't want to feel like ‘the masses'."